...is what Duke Eberhard Ludwig is often quoted as having said. As legend has it, this point of view was one of the reasons why he founded Ludwigsburg in 1704. The Residential Palace, as well as the porcelain factory (which was founded by Duke Carl Eugen in 1758 ) and several historical museums form the magnificent centre of the town. Close by and just as impressive are the hunting lodge and summer residence "Favorite" and the Lakeside Palace "Monrepos". Grand Gardens of a size of about 300.000 square metres which surround the Residential Palace, is home to the garden show "Blooming Baroque" and the Fairy Tale Garden, which is great fun not only for children. In the lively city centre visitors can tour the baroque residential districts and the birth houses of famous poets, go shopping, and feast in restaurants that offer old-fashioned Swabian local specialities. ...Ludwigsburg is a delightful, modern city, in which history, present, and future fuse. The city has many different faces. It is the county capital and has about 85.000 inhabitants spread over seven districts. 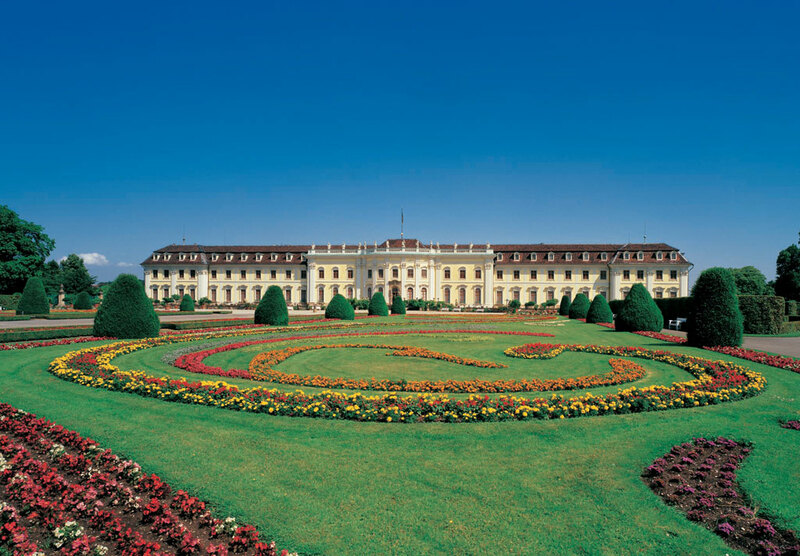 Ludwigsburg is one of the most prosperous economic centres in the state. It is home to about 50 factories, 1200 craft-oriented and commercial companies, and over 2000 wholesale and retail outlets. Especially companies of the media sector settled their premises in the city. Accommodating a training college for teachers, the University of Applied Sciences, and the only Movie Academy of the state, Ludwigsburg is also a centre of education. The city is said to be the cradle of Swabian poetry, and in the past the kings of Württemberg resided here. Webcam: Live pictures from the blooming gardens of the Residential Palace.